Winter is not my favourite season. I abhor frozen toes and fingers, chapped lips, chattering teeth and slipping cars. But this week, while driving to Netherlands, I saw the beauty of a snow covered Europe. The bare trees stand straight, fingers inching to the sky, kissed by the faintest sprinkling of snow. When it’s 5 PM, I won’t be able to see the snow; just the silhouettes of the landscape. I can see the treacherous hardened ice on the pathways to work. If I stand just so, I can hitch a ride and slip all the way to the steps. If I place my gloved hand on that post, I leave an imprint of my palm on the cotton soft snow. I am a child again. And I want friends so that I can enjoy a good snowball fight. But, I am rambling… lost in this crazy love for the perfect little crystals that Jack Frost lovingly fashions. I can touch one and it melts. Like quick silver, it’s gone. The view from The Building speaks to me of the paintings I see in a dozen museums- some Belgian, some not. One of our rooms is called by the name of the painter. His name is Pieter Breughel, the Elder. I find this funny. That I can see a scene or a piece of art and think that I know a(nother) piece of art that looks similar. A friend and I were touring the British Art Gallery (amazing pieces, much prefer it to the British Museum). I was extolling the virtues of one of my favourite painters (Caravaggio), “He paints in these dark shades, his subject matter is dark, and you can see the shadows lengthening. The paintings look a bit like that one there.” I pointed to a mid size painting near the entrance. I am turning into a culture vulture. It might not be long before I acquire myself a chihuahua, drop it into a large pink bag and stride down the Parisian boulevards, 5 inch heels clicking on the cobblestones, nose in the air. The idea is not appetising. Meanwhile, I can take solace in acquiring millions of pieces of useless trivia about World History. Or maybe not, that is just going to turn me into an obnoxious little twerp with a know-it-all voice. Sigh. I can never win. The waves rolled on, regardless of the life snuffed out on the rocks far far below the sheer cliff. Noone knew who she was. There was no convenient identification, no daytripper bag lurking in the sparse vegetation. It was how it was. It was how it was always meant to be. The Constable of the village scratched his head in puzzlement. It wasn’t often that unknown bodies washed up on the shore of the picturesque Greek town. Well, it had ceased being common after HER time. The Captain sipped his English breakfast tea and nibbled at his edition of the Times. One news item captured his attention and he read it slowly- his fingers & mouth sounding out the syllables. He did that when he needed to concentrate. The old English biddy was on her third cup of tea since morning. She delicately sipped the warm life-giving liquid holding theWedgewood cup between her thumb & forefinger (as recommended by etiquette books around the world). She was entertaining her great nephew and his new wife today. Charles & Mary were so young… and so full of life. She would almost be tempted to call them naive. “What happened there, aunt?”, asked Charles. The aunt took another sip, “I just like to call it the Agatha Christie Syndrome”. A new realisation- you know that inner voice that sounds out all the words you read in daily life? Lately, mine has a French accent. Especially with words like passage (puh-sahge), orange (or-hange) and message (meh-sahge). English desis wearing Paul Smith suits and toting the latest Blackberry Curves are a dime a dozen. They also universally seem to congregate around Leicester Square during evening and conduct loud conversations on their phones- swinging their hands around and looking at the sky. (Damn you, handsfree). There must have been a reply of some sort because the guy replied after 10 seconds. Dude, I am sorry for sniggering behind your back. I really am. Like leave their relatively-safe-job and come home during a recession. Just to feel all loved up. Just to make it absolutely clear- I wouldn’t. Then there are those perfect moments, when you see Timmon and Pumba singing their hearts out. Maybe someday that little lion cub will learn that the philosophy to live by is to just stop worrying. And it’s not all that hard to remember that 14 years ago, you had cried over Mufasa’s death. This time, you are excited, even though you have to contort yourself just so that you can see the top of Sarabi’s head during the opening scene at Pride Rock. Yes, I watched Lion King at the West End! you walk from Foley’s at Tottenham Court Road, with a slight digression at the British Museum and Malabar Junction to Oxford Street and from there to Charing Cross Road, Leicester Square and find yourself back at the British Museum. Then you walk towards the other end to magically find yourself at Covent Garden, back at Leicester, Picadilly and suddenly at the National Gallery. You just found your way home! I still don’t understand modern art. But I really liked the sticky toffee pudding at the Tate Modern! Parking for Princesses only. All others will be Toad. Sales lesson #1 for the extremely-expensive-China shopkeeper on Portobello road. When confronted by two people- one, an Indian girl wearing summer clothes in Britain and two, a ditsy American blonde (and her clueless husband wandering in and out) here’s how you might be able to sell a few cups the next time. Especially when the Indian hadn’t said anything when you informed her rather snippily about the price of a Wedgewood teacup. It’s her mother’s birthday after all. Mothers deserve eggshell thin dainty tea cups. You’d run back to your favourite customers who were still giggling nervously in front of the cake dish. Our London office is on Jermyn Street near Picadilly Square, right behind the steeds of Helios. You really can’t miss it, if you know what you are looking for. Apparently, a century ago, Jermyn Street was a bustling red light area. Sorry, dude. I just couldn’t resist it. Your books are now all stacked on your dresser. Happy reading! I thought about it a while and typed decisively. It was the first time I was going home in almost a year. And hell, I wasn’t going to lose my chance to go and see my friends in amchi Mumbai. A few mails and general mayhem ensued. Happiness! I was going to meet at least Kenny (all the way from Hong Kong! Amen), Vinay (from Hyderabad) and Abhay! Yay. This trip looked great! Who cared if I had a sum total of three days in India of which 2 days would be back home in Kerala. I was meeting friends. Oh wait. And family. The connection to Frankfurt (Deutsche Bahn ICEs- my favourite trains!) and to Kochi, (Deccan Air- so not my favourite) were done. Using my newly-learnt principles of JIT*, I had optimised my time to 1 hour at the Frankfurt airport and 2 in blissful Dubai duty free! Life’s great, ah non? Printouts of all tickets. Check. Cometh the hour, I clambered onto the train to Frankfurt Flugenhopf and prepared myself for a short-ish train journey. Till Koln happened. Till they announced in3 languages (German, French and Dutch) that we would have to change trains at Koln because the present train has an (I quote) engine problem. Ack! I HAVE A FLIGHT IN ANOTHER 2 HOURS! We were unceremoniously booted out into the station. People were running through the platforms to the next ICE. They refused to let us in. I was freaking out. My mother was freaking out. I was freaking my mother out. (Ah. Not so hard to do, by the way). The train left and I was left alternately staring at an empty platform and my watch ticking away the minutes. 30 minutes passed and our replacement train pulled in. The conductor announced that the train would reach Frankfurt 40 minutes late (which, observant readers will note leaves me 20 minutes to change terminals, go through immigration, security check and board. Oh yes, the gate closes 15 minutes before departure). And oh yes, the Deutsche Bahn apologised for any inconveniences. I started plotting scenarios where I won 1 million euros from DB for mental agony. And yet, time ticked on. I gave up making money off this sad state and starting calling other airlines. My friends’ faces were swimming in front of my little eye, which is the eye of solitude. I was mentally mapping my epic run to Terminal 2 and the gate in my head a million times. Freaking out some more, of course. The train threatened to pull into the airport bahnof at 8:40. (Ah, I have 30 minutes! Wow) I pulled my suitcase out. The elusive airport remained elusive. Till 8:50 happened and the train pulled in. I punched the green button and ran out. And promptly fell over a German Herr’s suitcase. From my vantage point, sprawled on the ground, I looked at the man with a hurt look on my face. He apologised and I waved it off, running to the escalators, my strolley bumping along the steps as I ran up and down. Run, run, run… out of Terminal 1.After 2 minutes, I reached the outside, and went to a taxi to beg him to take me to the other terminal. The man had a stupefied look on his face and shook his head. “Pleaaaase?” Like it would change ANYTHING. Argh, I had to run to the Sky Train. Now, Frankfurt Airport is a huge monster. I ran to the other side of Terminal 1 and up the escalators. Right in the middle of the checkin area, I lost sight of the sign of the sky train and the gates D and E. Yelling at the information guy seemed a good idea. I ran like a pack of angry dogs were behind me. (Yes, I forgot that there were things called lifts in this dratted place). Up those blessedly short escalators only to see a sky train pull out. The German police in front of me looked startled. I snapped my mouth shut, remembering old times of them checking my Schengen wherever I went. The next Sky train pulled in. I sedately walked in and sat down. The watch said 9:00. Hope was almost dead. The train clattered to Terminal 2 at 9:03. I was off like a shot down the stairs and straight to immigration. The policeman picked up my passport. And spent a few minutes trying to find a valid Schengen. He shook it a little, hoping for a magical schengen visa to drop out. He took it up lesiurely and looked at the photo. And at me. Then the first passport. He mentally translated the Dutch to German. Swatted a few flies and handed over my documents. A bullet from a gun couldn’t be faster. Thankfully, Gate E2 was the first one. I sneaked a glance at the watch. 9:06. This was my last leg… and maybe my last legs too. The barriers snaked through 3 rows. I ran through them and pushed my bags into the scanner, pulled my belt out and told the security guard I was in a hurry. Just for that, he passed my laptop bag twice through the scanner. The time was 9:10. The girl in front of me snapped at me. Visions of me hitting her on her dumb head instead danced through my mind. I muttered “sorry” and looked towards the Promised Land. The Boarding Gate. My eyes misted over. Would I be Moses? I ran. Again. Two women and a man sat there idly, chit chatting. I arrived. There was no other word for it… hands flailing, bag strap trailing, shoelaces undone. I nodded my head furiously. I stared at the man and burst into tears. The air in the gate became a little tense. I nodded my head again, wiping my eyes. “But… now… the flight…” (Some more wailing ensued). “Brusselssss”, and the wailing continued. The man talked on his walki talkie and 2 minutes later said I could go. And again, I ran. But this time, between crying and saying thank you. She grimaced and yelled at him in German. The gist was… “Let her go”. And I ran again. Down the stairs, through the still open First/Business concourse into the airplane, waving at the sweet woman. In the Boeing, I collapsed. The cool airhostesses looked a little alarmed. I was gulping some deep breaths. They pulled my bag for me into economy. Once in my seat, I drank 2 bottles of water, and promptly fell asleep, neck all askew, dead to the world. Moral of the story: A stitch in time isn’t as good as 9 tears later. Second moral: Take the direct flight from Brussels next time. Reading: Mindless, trashy, chicklit. Just because I can. Singing: A variety of tuneless renditions of The Bee Gees. Loving: This city I live in. Sleeping: Like a log. But to the time zone in Singapore. Wanting: To go across the road for a nice walk. Feeling: Like just walking away from it all. Or How can a small country bug the hell out of me? Unto them was born a daughter in the autumn of 1984. Big Brother was temporarily not watching as the gunshots rang out in Delhi and the Iron Lady fell. But, Maj. and Mrs. George’s attention was held instead by the little fist that clenched their fingers. It was thus decided in a hospital in the city of Patiala, Punjab that I would be named Shruti Susan George. I grew up and by 5 years of age had acquired my first passport. It was the cause of many weird glances when at the age of 12 I went to Singapore, looking nothing like the cherub on the first page. The passport expired in 1999 and it was time for a new one. I finally got it- pristine and the blue covers gleaming- not knowing the mauling it would be getting in the next 10 years of its existence. While the passport saw a few South Asian and Middle Eastern countries during the first 6 years, life had taken its owner from school to engineering to the Well Known Institute of Management between Jayanagar and Arekere. Life saw a few more turns and I found myself destined for a consultancy and working in, of all places, Europe. 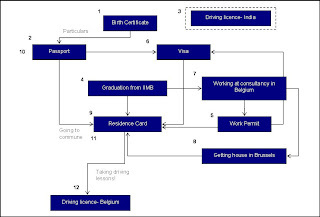 The Firm took care of the work permit and in June I was in Brussels, the capital of Europe… searching for a home. Ixelles, it was then, 1.5 km from office, nearly 100 m2 of house- fully furnished and ready to empty my bank account every month. Oh god. I hadn’t learnt yet! The whole story coming up! Soon.